Beast Rider Strides Into COTG Live Event Game! The original Champions of the Galaxy game featured as beloved undercard hero known as BEAST RIDER who has morphed into a fan favorite over the years. Now thanks to the brilliant performance of Robert Evans, Beast Rider has a whole new look and an even bigger fan following as part of the Champions of the Galaxy Live Event. Beast Rider, a Neptunian Space Cropper, entered the GWF to take on Thantos’s robotic creation Death Knight in a battle of Primitive vs. Mechanical combatants. In his new incarnation he is accompanied to the ring by the lovable creature from his Intergalactic Zoo, Tucor (of Kaiju Big Battel fame). 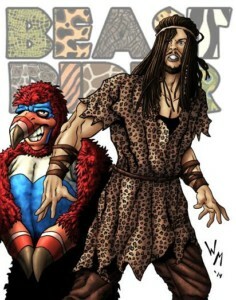 Beast Rider is set to BEAST KNEE SHUFFLE his way into the hearts of all wrestling fans! The COTG Live Event game edition will be available in early October. However, you can watch the event for yourself on MP4 download or on Video on Demand right now from smartmarkvideo.com. It’s the most unique wrestling event of the year! ← COTG Live Event Video Now Available to Purchase!